Various evaporation techniques are used to concentrate fluids in wide ranging industries, including dairy, food, pharmaceutical and chemical. The reason for evaporation or distillation may be to concentrate a product, such as milk. It may be part of a crystallisation process or a pre-treatment to a drying process. It is also used as a method of reducing the volume of waste or effluent that needs to be handled. Whatever the reason for evaporation, it always removes liquid (usually water) from a solution by turning it into a gaseous form. It is an energy intensive process and is often one of the main contributors to the operating costs of a plant. Rising energy costs in competitive market places make the choice of evaporator used in a process an extremely important decision. As well as factors such as viscosity, thermal characteristics of the solution, thermal impact on the final product and required output rate, the type and price of energy to the process is a major criterion for selection of the best evaporator for a given application. An evaporator works by adding heat to the solution to a point where liquids turn into vapour and can be separated. Compressing the vapour produced increases its pressure, which increases the temperature in the vapour and in its condensation point. This higher temperature means that the vapour produced from the process can be used as the heating medium for the evaporation. For large sanitary and industrial evaporators, there are two main methods of compressing the produced vapour – mechanical vapour recompression (MVR) and thermal vapour recompression (TVR) or a combination of both. MVR uses a mechanical compressor or a fan to compress the vapour. TVR uses steam jets for compression. Operating costs can vary dramatically, depending on price of energy. A TVR evaporator requires a ready supply of steam available. A MVR evaporator needs an ample electricity supply but requires no primary steam except at start-up. A plant design can utilise multiple effect evaporation – evaporator units installed in series to minimise energy usage. 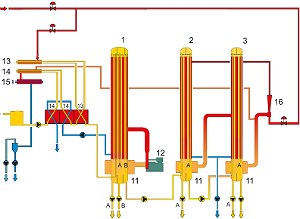 For TVR evaporation, steam may be re-used across the evaporator units of a multiple effect evaporation system. The temperature difference per effect decreases as the number of effects increases, necessitating a larger heat exchange surface to reach the required evaporation rate. Overall the use of multiple effects in TVR evaporation decreases the amount of the steam required but has an increased cost for equipment. An MVR evaporator is typically designed as a single effect, occasionally in multiple stages that operate at the same pressure. No cooling water is required and the process heat is continually recycled. The condensate produced can be used to pre-heat the incoming feed solution. The mechanics of this type of evaporator limits the temperature difference between the steam and the solution to be concentrated. This necessitates a large evaporation surface and increases initial capital investment. However, this small temperature differential has the benefit of making MVR evaporation an extremely gentle process, preserving product characteristics such as flavour, aroma, colour and nutritional value. The above process is illustrated in the process flow image below. The compression of the vapour within a MVR evaporator can be achieved with a number of devices. A higher compression ratio provides a higher temperature differential available to the evaporator. Turbo compressors perform well enough to allow multi-effect MVR evaporation but their high speed operation makes them vulnerable to water droplets and they require regular servicing and significant protection within the system to reduce the risk of failure. A fan operates at a lower speed and has a higher reliability but has a greater limitation regarding temperature difference. However, the high thermal efficiency of a MVR evaporator means that single effect has the net equivalency to many TVR evaporator effects. In some applications a single MVR evaporator may offer the thermal efficiency of up to plus 50 effects. The operational savings using MVR are significant and the higher initial capital investment cost may be returned after just one year. The larger the evaporator capacity, the greater these savings become. Increasing energy costs are making MVR a popular choice for medium to large capacity applications. The choice of evaporator is highly dependent on the application and the primary product characteristics. The additional investment in mechanical compression required by MVR evaporators does make them more expensive than multi-effect equivalents. However, unless steam is readily available at a very low cost, the operational savings offered from MVR are considerable and make them financially attractive. MVR Evaporators are highly reliable and very easy to control and operate. Their gentle operating conditions make them ideal for food, beverage, pharmaceutical and chemical applications, where it is important to retain and protect product characteristics for high-quality end product. If suited to the product characteristics, MVR evaporation uses less energy and is a good, environmentally sound choice with a rapid and clear return on investment.